Follow the directions to reach the Rollrights stone circle, from Chipping Norton. Walk past the entrance to the circle along the road for a coupla hundred yards, keeping your eyes peeled looking into the field on your right. You’ll notice the large rocky mass of these Knights a hundred yards down in the field, which can be reached by a footpath running straight along the old hedge from the roadside straight to the collapsed tomb. Laying there, I smiled at the little fella, who then decided to jump up the side of my waist and walk over the top of me to get to the other side! He jumped down into the grasses and disappeared! However, a few minutes later, I felt another tiny ‘thud’ at my side and looked down to see the same lovely mouse wanting to go back along his obviously traditional route – and looking up at me again, whiskers twitching inquisitively, realised I was still here; and so once again took it upon himself to climb over the scruffy smelly human-sort who was blocking his route! 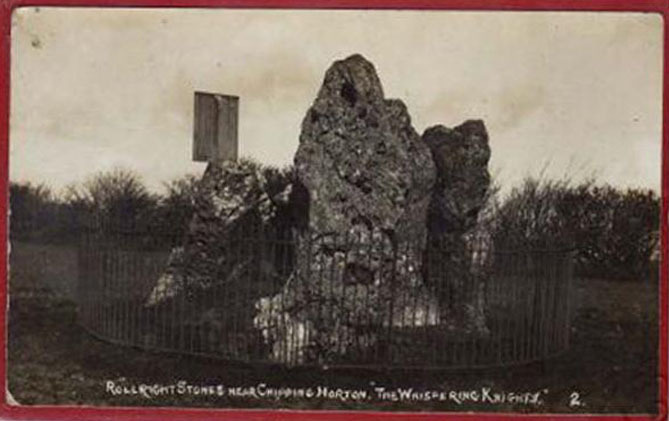 The Whispering Knights is one of the main sites in the cluster known collectively as the Rollright Stones, which also comprises of the standing stone commonly called the King Stone, plus the King’s Men stone circle a coupla hundred yards down the road from the Knights. They all sit atop of the ridge which separates the counties of Oxfordshire and Warwickshire along the edge of the prehistoric road known as the Jurassic Way. The sites are non-contemporaneous having been erected over a period of many centuries. The Whispering- or Five Knights are by far the oldest part of the complex dating from a period never previously anticipated. They comprise of four upright megaliths in close proximity, and a fifth fallen stone which is said to be the capstone on the original monument. This stone alone weighs some 10 tons. The general archaeological opinion is that the place is a ‘portal dolmen burial chamber’ of which the capstone has fallen. 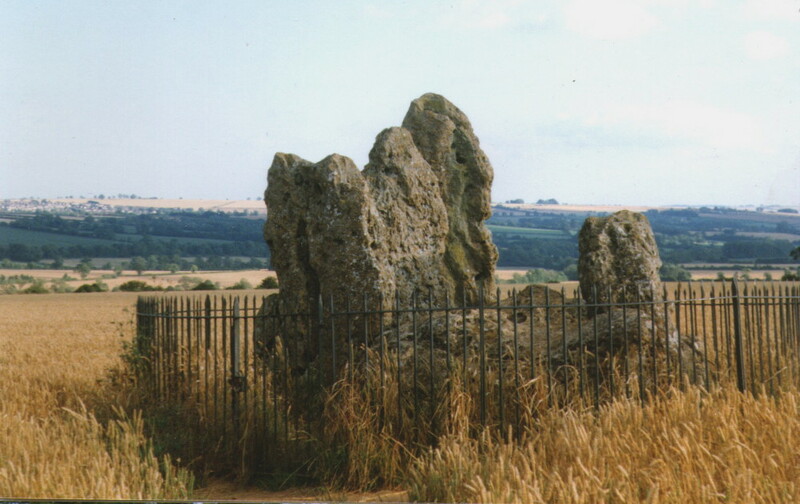 The Oxford archaeologist George Lambrick (1988) postulated the stones to have been covered with a mound of earth, but any evidence supporting this has long since gone. This great monument was initially thought by archaeologists to have been built sometime around 1800 BCE—a favourite date of academics for many an unexcavated site for many decades—until they turned their astute attention to the place in the 1980s. And what they found was astonishing. Well…astonishing for the archaeologists! Affirming the local folk tradition that the Knights were the “oldest monuments in Oxfordshire,” the dates truly went back. Way back! Datable remains at the site gave results from between 3500 and 3800 BCE: two thousand years earlier than anyone had ever expected of them. During the last century, very little has really changed at the Knights. The ring fencing surrounding the stones has kept it pretty much protected, despite it ruining all sense of healthy ambience. But they have gained greater and greater attention the older they have got. Archaeologists are not the only ones exploring the site. Fascinated astronomers, engineers and architects have been and seemingly uncovered other mythic ingredients here. 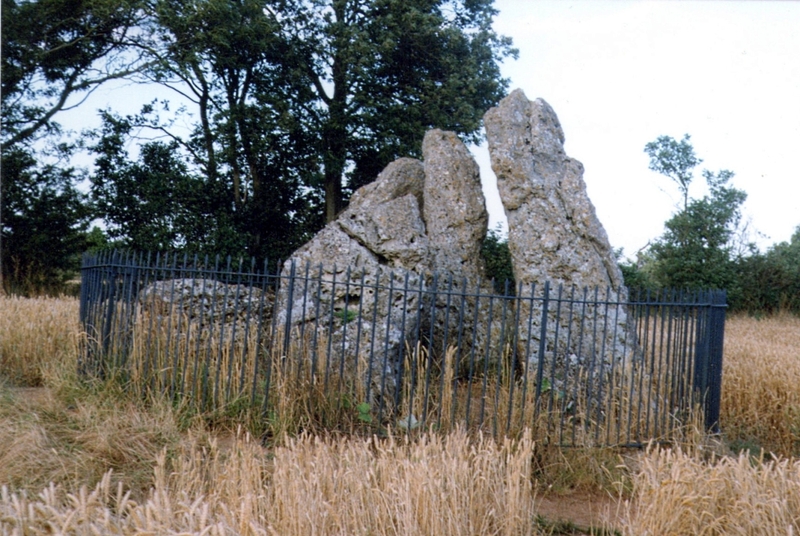 When the legendary Alexander Thom came here, he used the archaeological data that was being espoused at the time, which said the Knights and the Rollright stones had both been built around 1750 to 1800 BC. With these dates as his guide, he found that someone standing at the centre of the Rollright circle, on the morning of the equinoxes—March 21 and September 21—the sun would rise right above the Whispering Knights. And the effect, he thought, was a notable one: with the light from the rising sun going straight through a hole in one of the stones in the circle as it rose up behind the Knights. It would have looked both spectacular and eerie in the rising mists of first light, like a laser cutting through the still morning air… However, although Thom’s measurements were very accurate, the archaeologists had got their dates wrong. Very wrong! For the Whispering Knights were about 1500 years older than the stone circle—and so the alignments Thom pronounced, based on the archaeologist’s erroneous proclamations, were also incorrect. As with many of the alignments described here, the jury is still out on this one! The folklore here is prodigious! The prime story of the neolithic tomb of the Whispering Knights tells that originally they were in fact a group of traitors who moved away from a King and his army in ages past, and who were plotting against him, when the great Witch of Rollright (a southern version of the great cailleach, found in more northern counties, Scotland and Ireland) turned them all to stone (this tale is intimately bound up with the King’s Men stone circle and the associated King’s Stone). 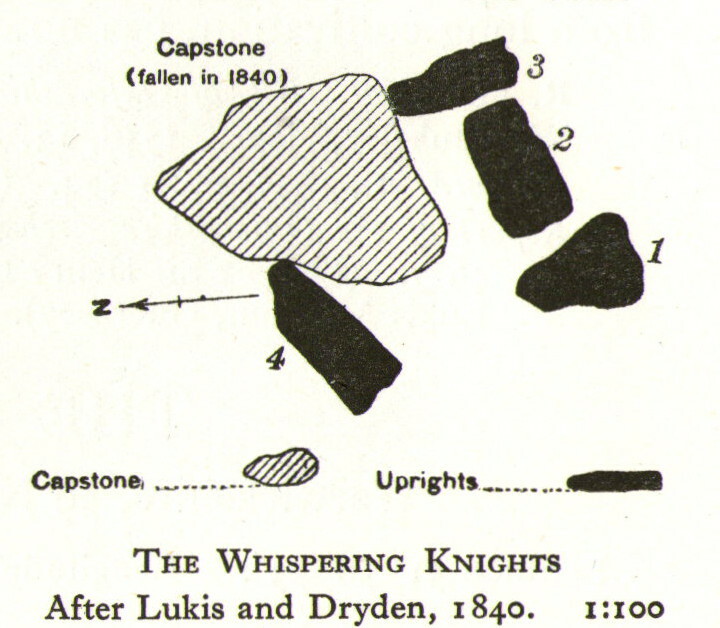 Another tale tells how the King Stone and the Whispering Knights venture, at midnight, less than half a mile south to drink from a spring in the small woodland at Little Rollright Spinney, although it is difficult to ascertain precisely which of the two springs the stones are supposed to visit. In some accounts, the stones reputedly drink from the well every night, but others tell that they only go there at certain times of the year, or on saint’s days. When Arthur Evans (1895) wrote of these tales he described there being a “gap in the bushes… through which they go down to the water,” but the terrain has altered since his day. In yet another version, the stone was wanted by a local farmer for his outhouse. In taking it downhill, the horses that pulled his wagon died and the vehicle itself was irreparably damaged. It got even worse for the poor chap: his crops failed, his family were taken ill and his cattle died. Eventually when all but his last horse remained, he made another cart and it pulled the stone back uphill with ease. Thereafter, so the tale goes, all his adversities stopped and he lived a normal life. In one version of this tale, the great monolith was said to have been taken north-north-west down to the stream at The Hollows, Long Compton. Tales such as these are, once more, found throughout the world. In William Stukeley’s day, one Farmer Baker was so troubled by his actions that he couldn’t rest until he returned the old stone. The doyen of the early geodelic sciences or Earth Mysteries movement, John Michell, suggested how the legends of megaliths moving of their own accord harked back to ancient days when the people of those times were more attuned to the terrestrial magnetic flows of the Earth. In more recent times, the site has been explored by dowsers and ley hunters, who claim to have found a veritable bags of fascinating lost material around the Knights. Although originally ‘leys’ were described by Alfred Watkins as quite acceptable prehistoric trackways linking site to site to site, in recent years the original theory has been ignored and superceded with a host of almost incredulous fluctuations. Leys these days can run just about anywhere – and do! This cross-talk of Wheatley’s involves more than seventy energy lines running between the circle and the King’s Stone. He tells us that a greater “aerial cross-talk” also occurs between the circle and the Knights; and “a lesser energetic triangulation” runs between the King and the Knights. Gelling, Margaret, The Place-Names of Oxfordshire – volume 2, Cambridge University Press 1971. Graves, Tom, Dowsing: Techniques and Applications, Turnstone: London 1976. Main, Lawrence, Walks in Mysterious Oxfordshire, Sigma: Wilmslow 1997. Smith, Reginald A., ‘Archaeological Dowsing,’ in Graves, Tom (ed. ), Dowsing and Archaeology (Turnstone: Wellingborough 1980). Stuart, Sheila, Lifting the Latch, Oxford University Press 1987. Stukeley, William, Abury: A Temple of the British Druids, London 1743. This entry was posted in Cairns, Tombs, Tumuli, England (south), Oxfordshire and tagged animism, antiquarian, antiquities, archaeoastronomy, Archaeology, astronomy, Bronze Age, burial, cairn, Chipping Norton, cursus, death, dolmen, earth mysteries, folk-lore, folklore, funerary, heritage, legends, megalithic, Megaliths, natural history, neolithic, Oxfordshire, prehistoric sites, Rollright, Rollrights, sacred sites, tomb, witchcraft, witches. Bookmark the permalink. The mouse was a great addition to this narrative! Fascinating and amazing. I love the story about the mouse! It is so sad that this kind of instinctive knowledge and the folklore linked with it is being gradually worn away by ‘civilisation’. I’m an admirer of Watkins also – years ago, reading ‘The Old Straight Track’ permanently changed my view of the landscape. Very good article but with one major mistake. The change in dating in no way affects the equinox sunrise as demonstrated by Professor Thom. Equinox is in the same positions today (over a 4-year cycle) as it was 10000 years ago. The Sun’s solstice positions are affected by the change in the Earth’s obliquity over a 41000 year cycle (nothing to do with the precession of equinoxes), but the equinox position, being a middle point between the two extreme positions, is not modified by a change in the Sun’s amplitude. People who do not understand Professor Thom’s work have been all to eager to dismiss it, thereby destroying one of history’s major contributions to the understanding of the long-forgetton megalith builders.